Low viscosity - very fluid. Produces a non-glare, low sheen surface that will intensify colours. Does not drastically reduce colour depth. 100% acrylic polymer varnish. Water soluble when wet. Good chemical and water resistance. Dry to a non-tacky, hard, flexible surface that is resistant to retention of dirt. Resist discolouring (non-yellowing, non-fogging) due to humidity, heat and ultraviolet light. Depending upon substrate, allows moisture to pass through (breathable). Not for use over oil paint. Protects acrylic colour from harsh elements. Apply as a final varnish over dry acrylic paint. 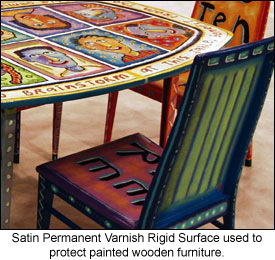 Varnish surface and environment must be clean, dry and dust free. Acrylic paintings must be completely dried and cured for 48-72 hours before varnishing. Application may be done by brush or spray. Generally a sprayed application will be thinner, smoother and more even. Rolling or sponging application is not recommended. 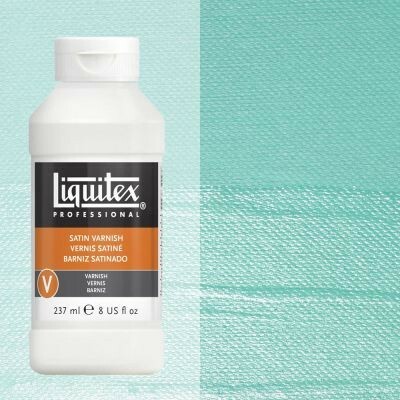 If more than 1 varnish coat is desired, apply 1-2 coats of Liquitex® Gloss Varnish before applying a final coat of Liquitex Satin Varnish. Caution: Acrylic paints and mediums become increasingly brittle in cold weather. Do not apply below 60oF.